Bridgnorth Station is the northern terminus of the Severn Valley Railway, situated in an historic Shropshire market town surrounded by countryside and disected by the River Severn. The main station building is Grade II listed – the only one of its kind on the Railway – and the whole station site is in the conservation area. The station’s history is a modest intermediate stop on the Worcester – Shrewsbury line, and originally built on made-up land due to its geology and proximity to the river. The site is therefore somewhat restricted and linear, and not designed for easy vehicular access, or visitor parking. The station is run predominantly by volunteers – from all walks of life – and some are not even train enthusiasts, but enjoy the friendly atmosphere. The licensed refreshment room, now known as The Railwaymans Arms, has stayed open for business throughout the station’s history, being first opened in 1861. 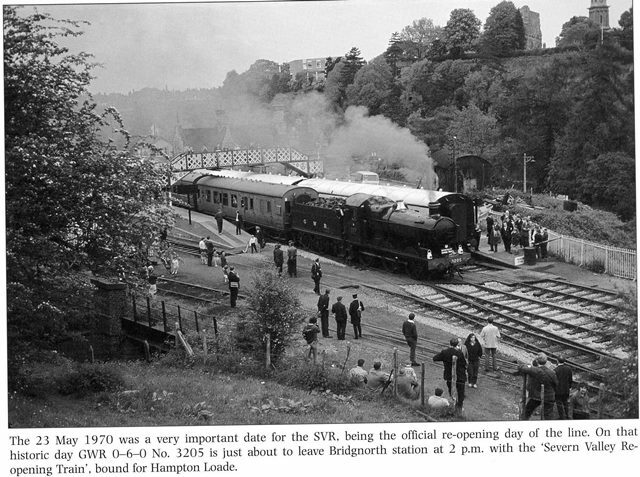 Being the spiritual home of the preserved Severn Valley Railway – where the restoration commenced in 1963, the station is a special place to many members and volunteers. There is a unique atmosphere resulting from the wide range of activity that is fitted into the site. Visit the ‘Join Us’ pages to learn more.